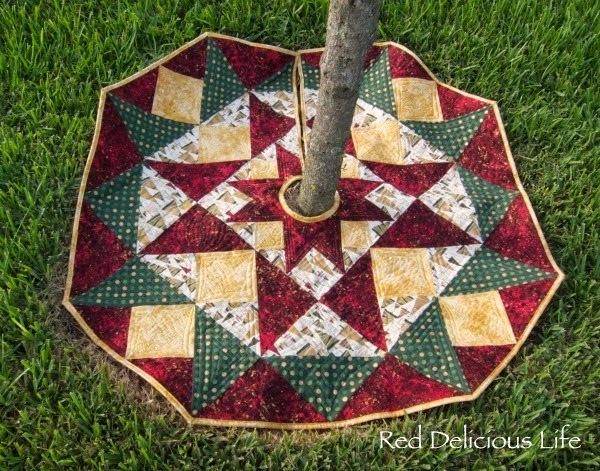 Just warning you upfront, lots of gratuitous photos of my latest finish, Triangle on Parade. 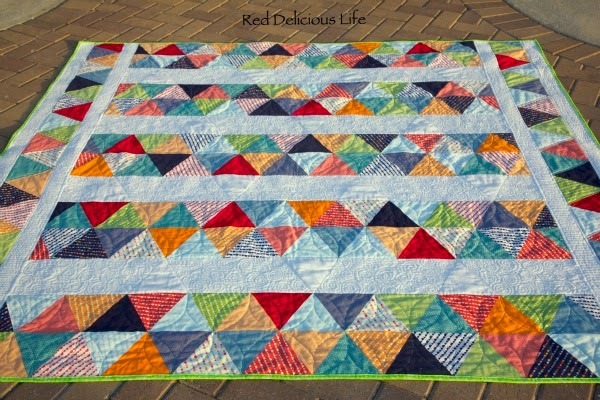 This is my favorite quilt so far, I just wish it were a bit bigger to actually fit on our bed. Ideally it's best for a twin bed, (possibly a double/full), coming in at 73" x 77.5." 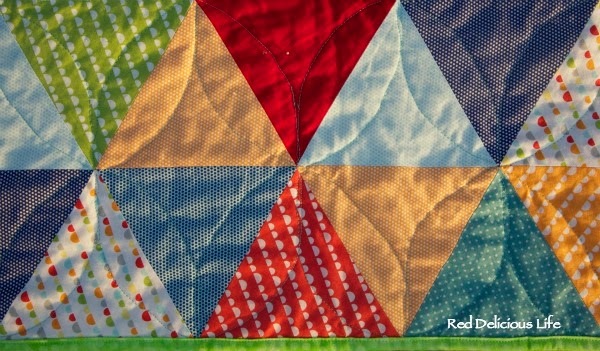 I had a heck of a time trying to quilt the middle of the quilt on my sewing machine. 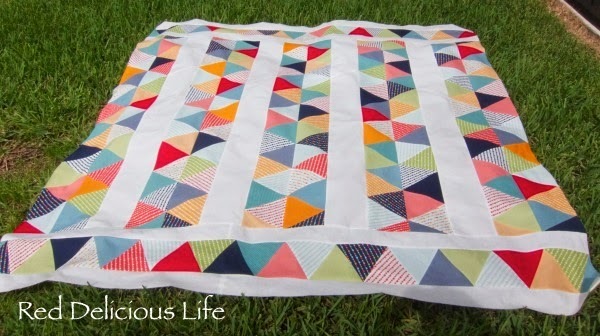 My Baby Lock Symphony is specifically made for quilting and has a large extension table and an 8-inch throat space but it was still a challenge. 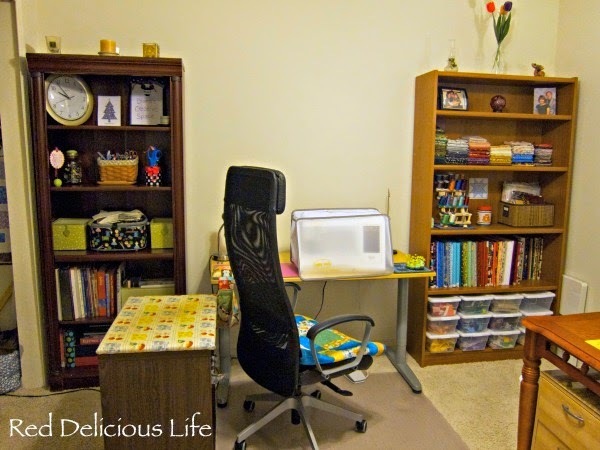 I ended up ordering a Supreme Slider which helped a bit but I look forward to the day when we replace our dining room table as I intend to convert that into a drop-in table for my sewing machine. 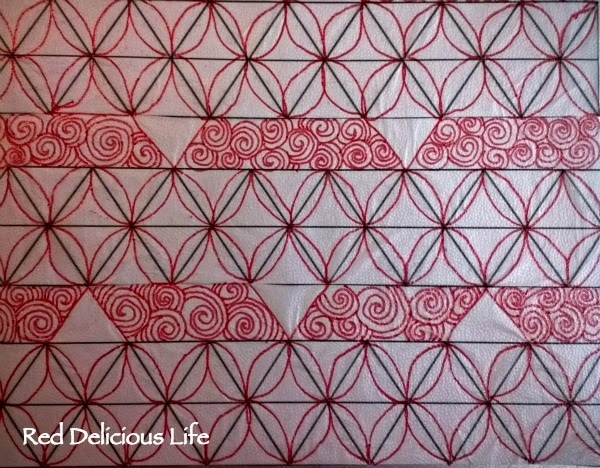 I've gotten really comfortable with quilting swirls. They've always been a favorite of mine. I love how they make the negative triangles pop. I almost like the back more than the front. I fell in love with this turquoise pin dot fabric from Michael Miller. 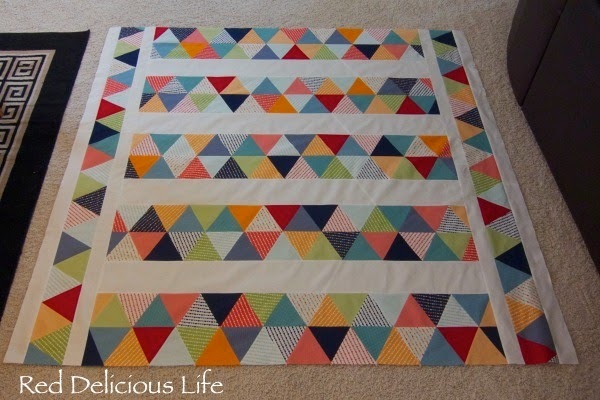 Since I had more leftover triangles I added a strip of them to the back as well. 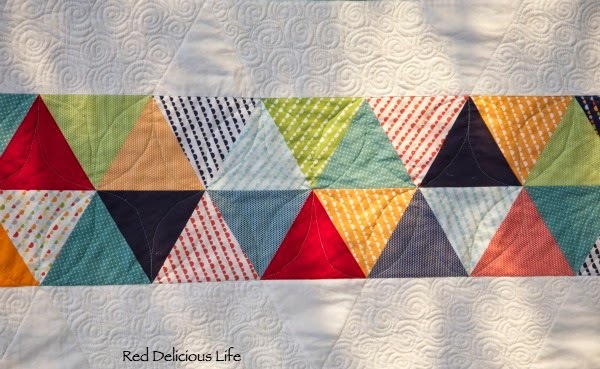 I even went as far as to line up this row with a row from the front so that it would get the same orange peel quilting on it. It didn't line up 100% perfectly but that's okay. 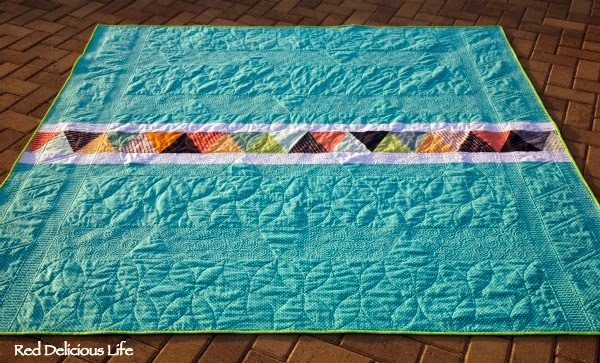 For the binding, I had envisioned a celery green solid but I couldn't find anything at the quilt shop that is closest to me. I didn't want to make a 40 minute trip to one of the other shops, so I opted for Moda's marble dots in a brighter shade of green. I still need to add this cute little label on the back. 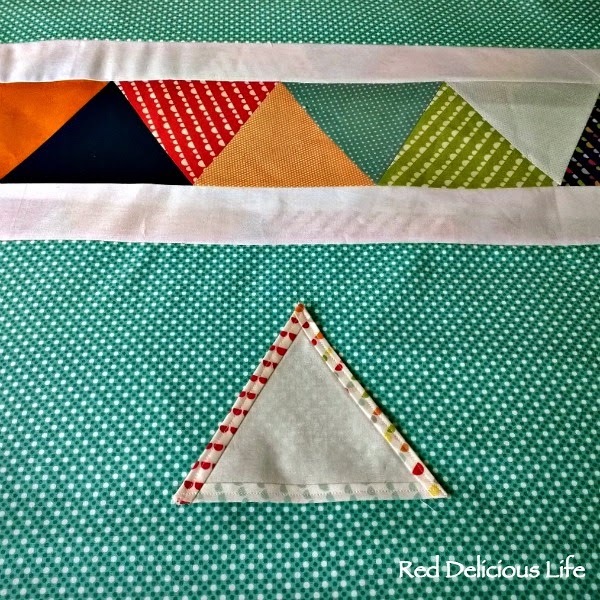 Yet another leftover triangle - can you believe that I still have more?! 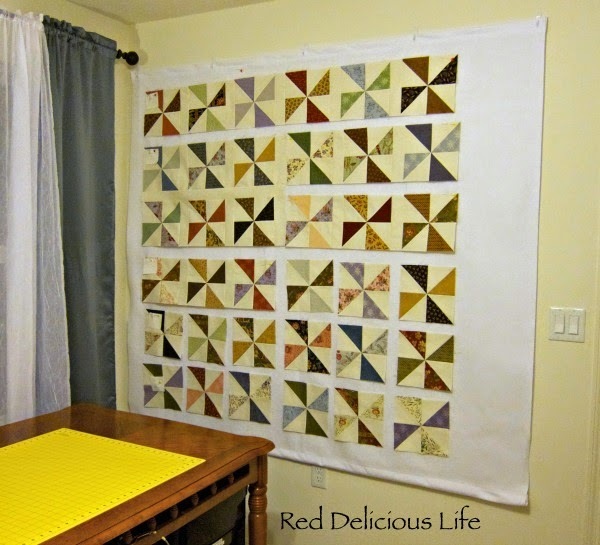 I made it on a whim before the quilt top was even basted. 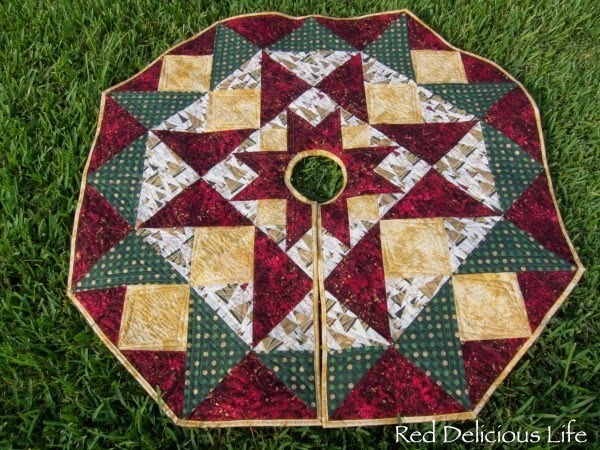 Picture taken before quilting was started. 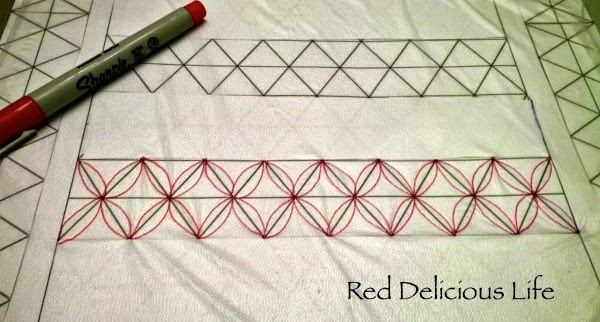 Instead of using a fabric pen to write the details, I'm going to hand embroider it, sometime this week hopefully. I'm not one for hand-sewing but I like the look of the hand-sewn labels. Okay, if you've stayed with me this long I guess a few more photos aren't going to bother you. 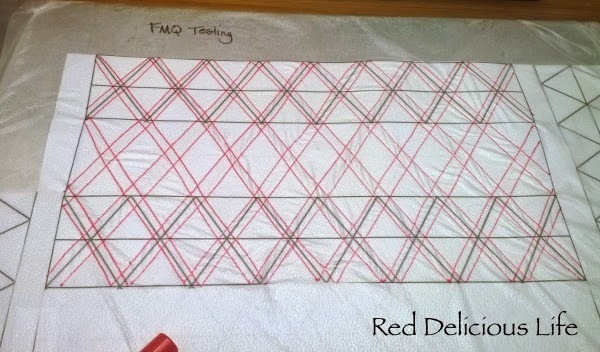 This was my first time quilting straight line squiggles (okay, that's an oxymoron if ever I heard one, but not sure what else to call it). 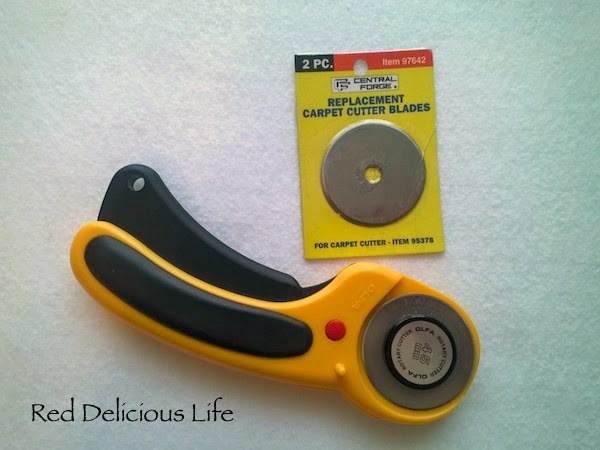 I really enjoyed them and they really add some nice texture. I'll definitely be using these again. Lastly, this just makes me want to sit down, get cozy, and watch the sun set. Never mind that it was practically 90 degrees today. 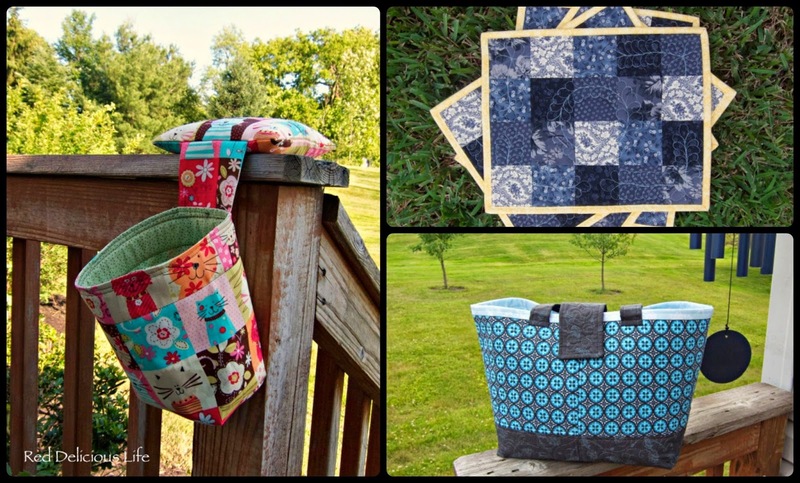 In addition to my regular link-ups, I'm also linking up to The Sunday Showcase by Stephanie Lynn, Amy's Free Motion Quilting Adventure' Free Motion Mondays party and Free Motion Mavericks over at Lizzie Lenard Vintage Sewing. I went to the dentist last week for my 6 month checkup. It's my first visit since moving to Florida so I had to fill out all the necessary paperwork. 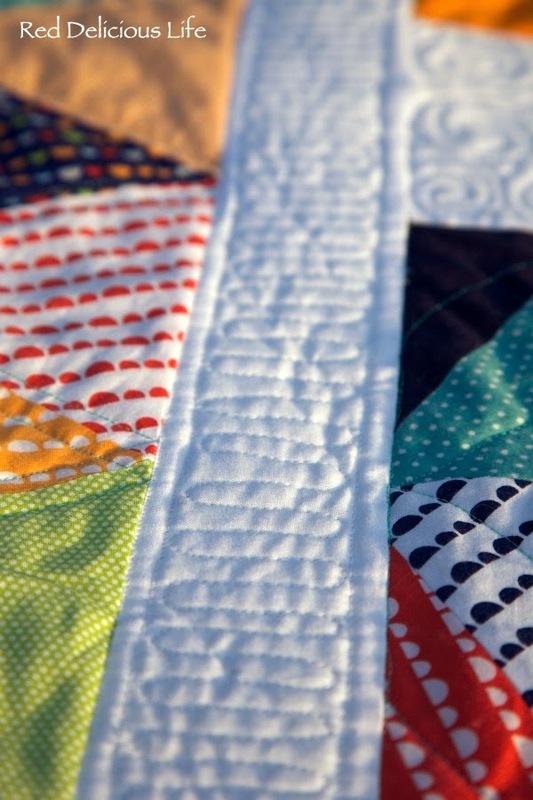 In the occupation field I decided to write "quilter." It just sounds so much better than "stay at home mom" or "not applicable." It's my favorite thing to do so why not list it. 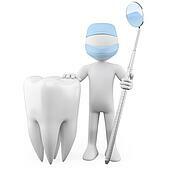 After the hygienist took x-rays and asked all the typical dental questions, the dentist came in to introduce himself. This is what he said "Hi, I'm Dr. Chris, it's nice to meet you. So, I'm guessing you like to stitch in the ditch." Add that to the list of things you'd never expect to hear your dentist say! 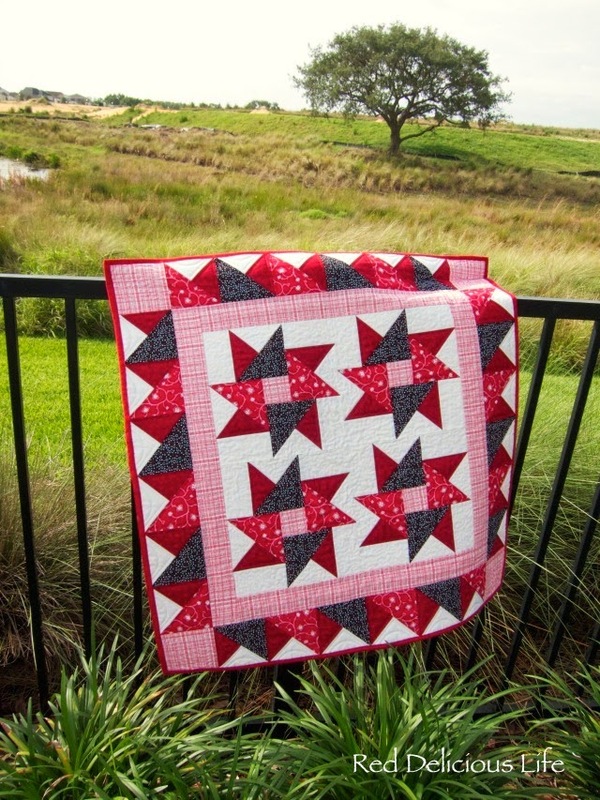 Sorry, not a quilting post today. 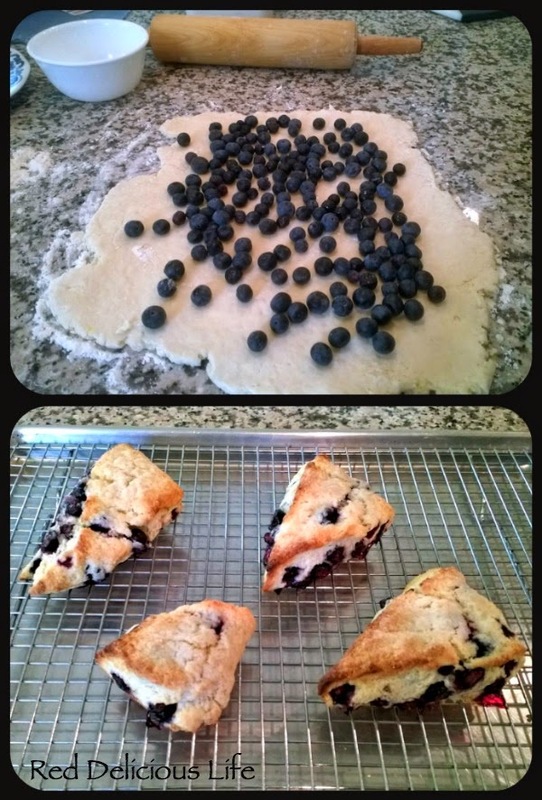 I needed to take a break from my sewing machine this afternoon and since I had 3 pints of blueberries I decided to make some scones. This is the recipe I followed. It's a bit labor-intensive, but man are they worth it! And the best part of all -- you can make these up ahead of time, freeze them, and then bake just 1 or 2 in the morning. 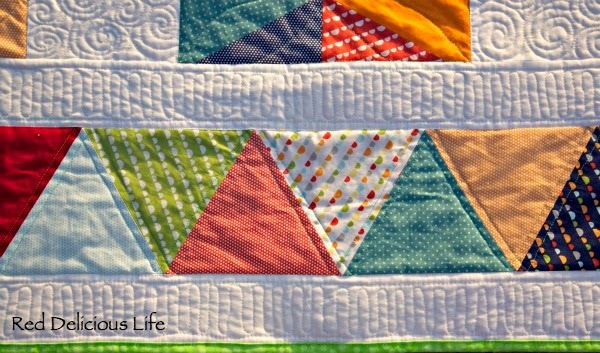 I think that's what I'm naming this quilt. Or maybe Parade of Triangles. Whatever I decide at least the quilt top is finally done. 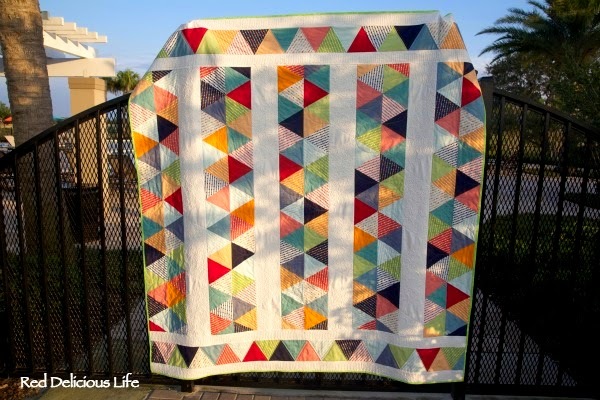 I still need to baste and quilt this bad boy but I'm pleased to finally have it all put together. I'm really pleased with how it turned out now that I added the white stripes. It broke up the chaos of all those different fabrics that was haunting me. 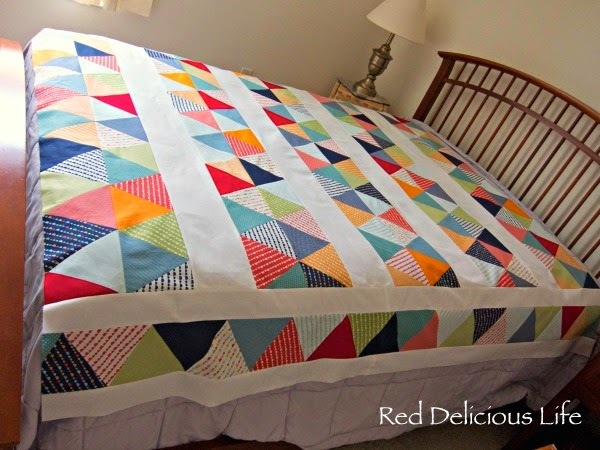 With the addition of the large white sashing I had extra rows of triangles so I decided to make a side border that would hang down nicely on the side of the bed. I tried to take some outdoor photos but it's hurricane season here in Florida. That meant some high winds and this was just moments before it got dark as night and the skies opened up. 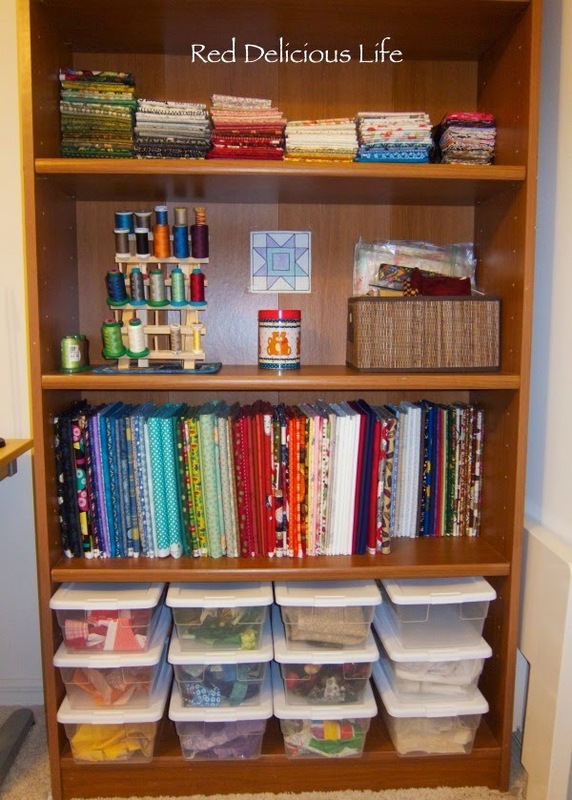 Love the mini bolts of fabric and all the scrap bins! 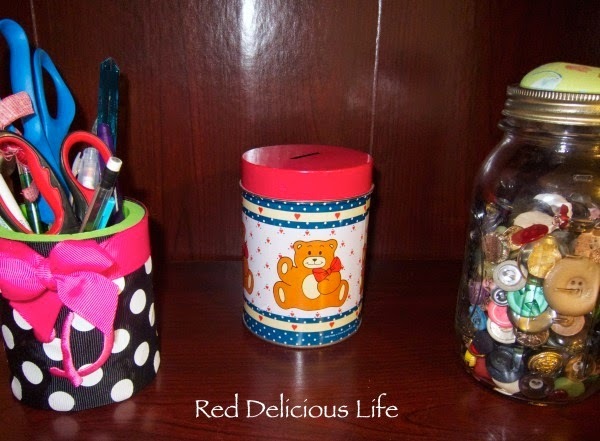 I am so excited to be the guest host today for the Anything Goes Mondays linky party! 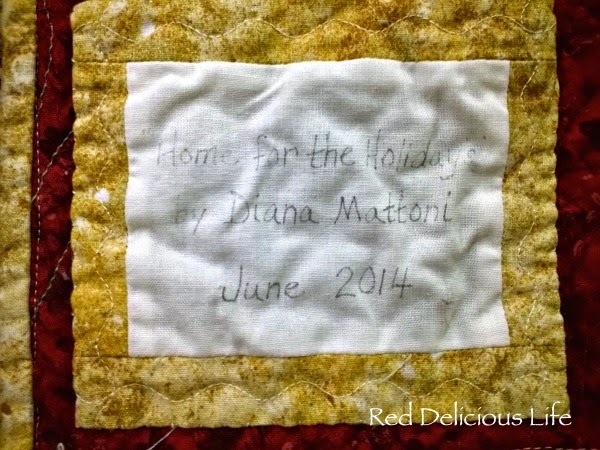 When I first started quilting 2 years ago, I stumbled upon Marelize's blog, Stitch by Stitch, and have followed her ever since. 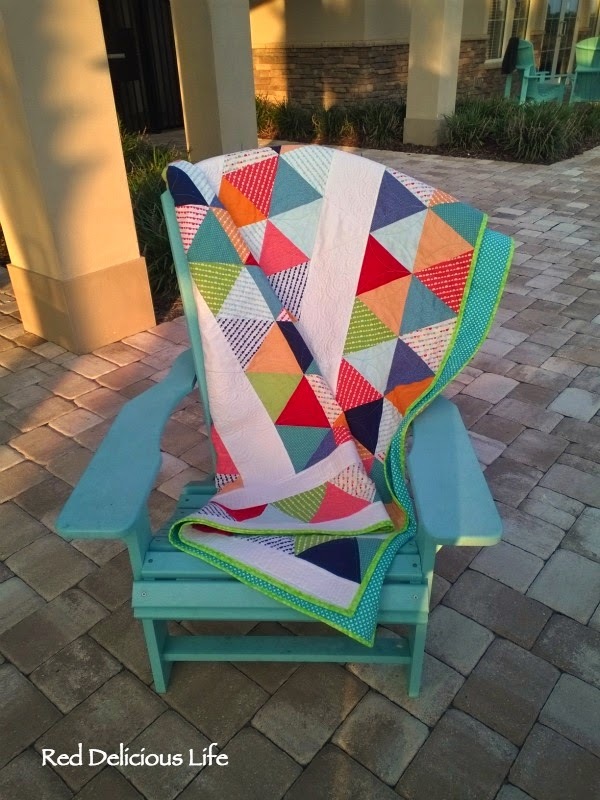 Her free motion quilting was just stunning and when I learned that she does it all on her domestic sewing machine it made me even more determined to quilt my own projects. 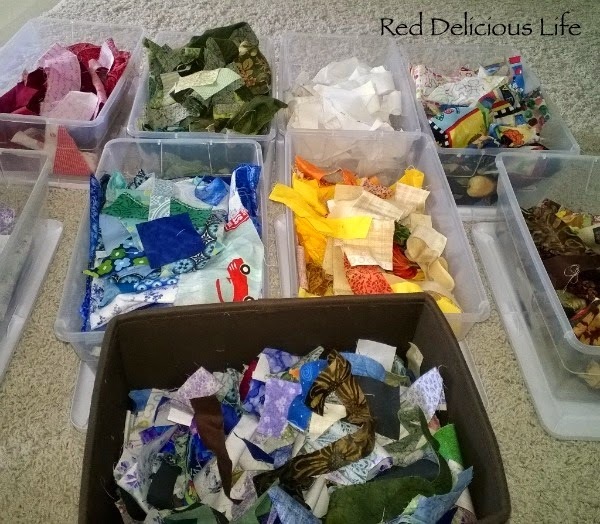 As a relative newbie to quilting I'm eager to learn everything I can which is why I have a growing list of projects that I want to tackle. 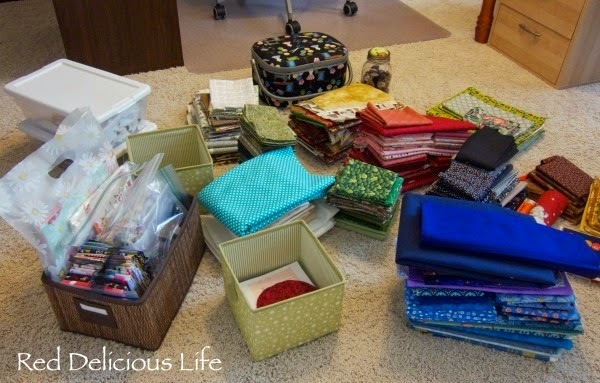 Many of my them are smaller ones like bags, thread catchers, and placemats. 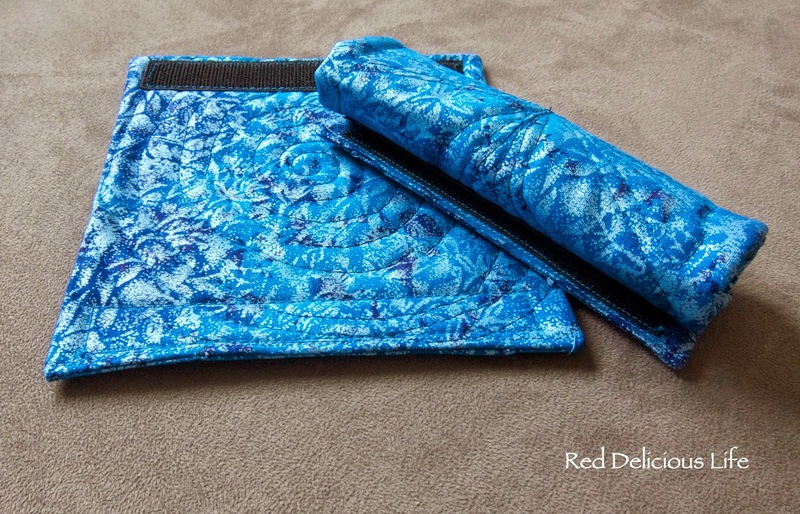 These allowed me to practice free motion quilting with greater confidence. 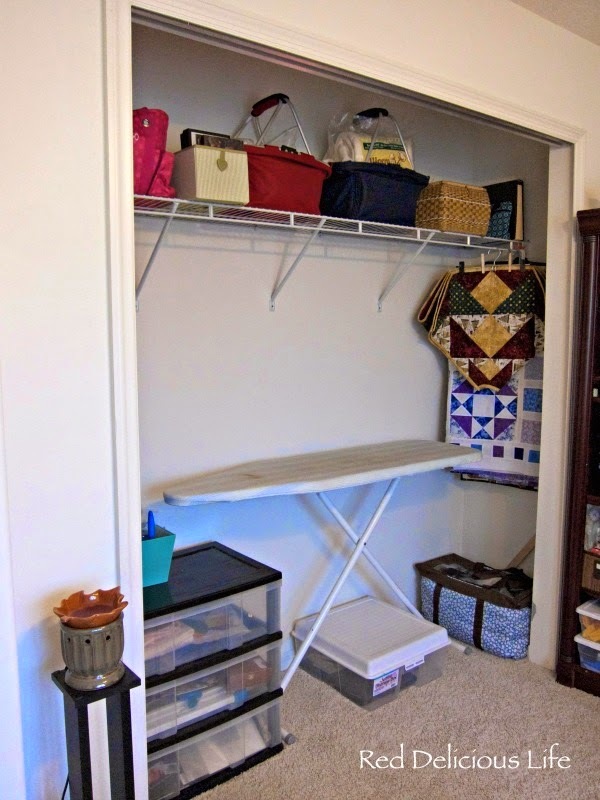 I really like wall hangings and want to make some minis for my sewing room in the near future. Again, smaller projects give me the opportunity to try new things. My favorite, Spinning Stars, got me comfortable with partial seams and stippling. 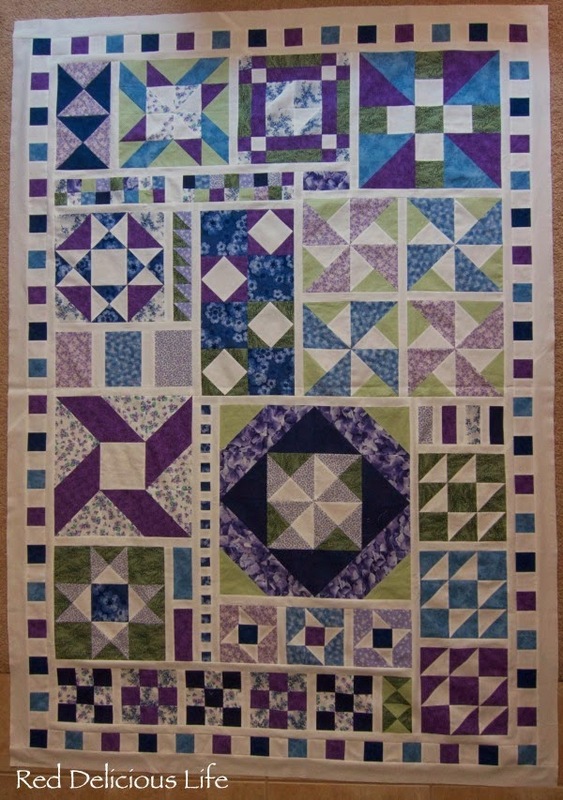 Probably the most complicated quilt top that I've made so far is the one I did for the Aiming for Accuracy Quilt-Along. I'm really pleased with how it turned out. Now I just need to figure out how to quilt it. Lastly, I need to introduce you to my faithful furry assistant, Oliver. 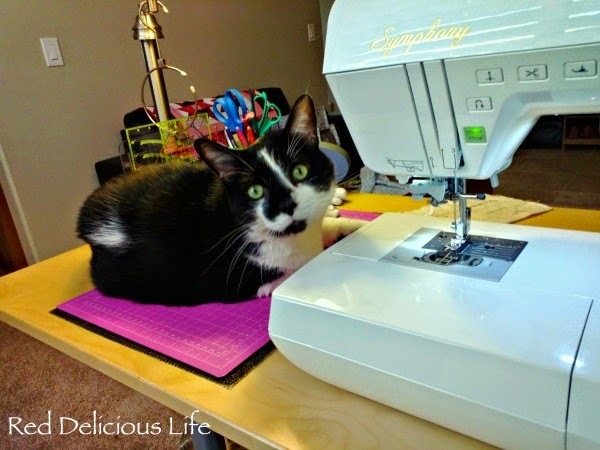 He loves to be in my sewing room with me. Okay, enough about me, now it's your turn! What have you been working on this week? 3. 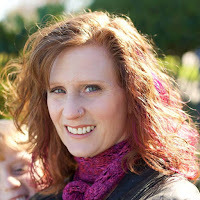 Try to visit at least a few of the other blogs linked, the whole point of having a party is to connect, share and maybe get a few more followers...remember to leave a comment to let them know you stopped by! Yes, it's Independence Day tomorrow in the US and some people might be heading home, but I'm talking about Christmas. 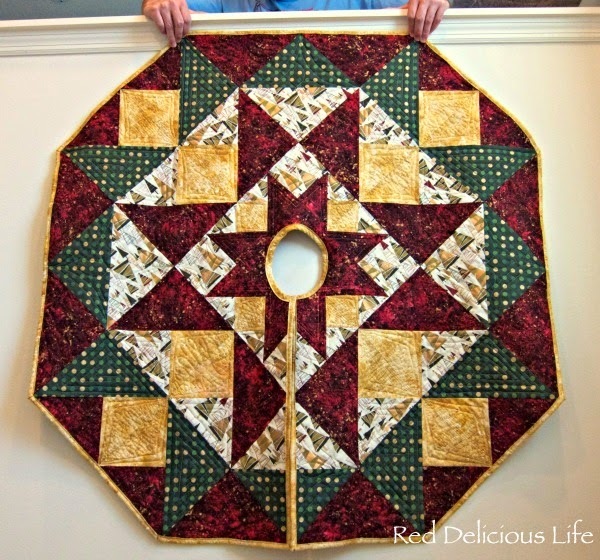 I finished my tree skirt and named it "Home for the Holidays" because it makes me want to have Christmas at our house! Of course we now live in sunny Florida so my fantasy of having it underneath the tree with prettily wrapped presents on it, while there's a roaring fire in the fireplace, with us all snuggled underneath a homemade quilt drinking egg nog is pretty much blown. Oh well, a girl can dream. Taking some nice outside photos of it also proved to be a challenge. It just didn't look right under a palm tree (not that I could find any small enough). 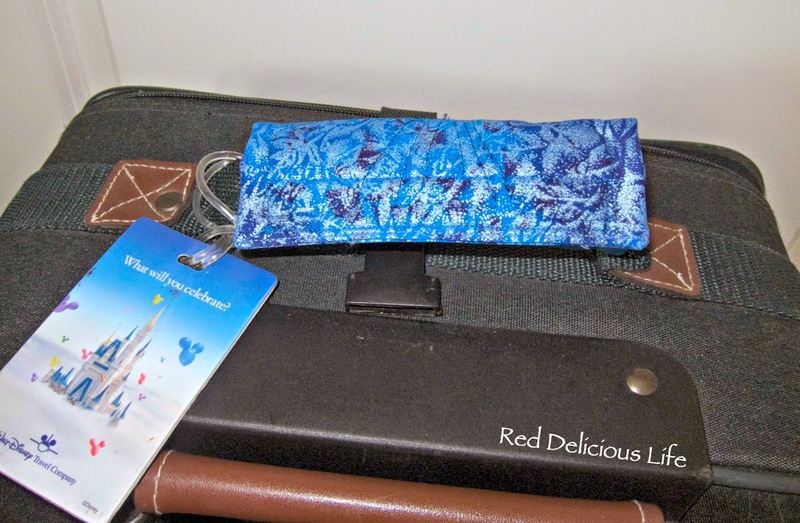 Snow would have been a better backdrop but I'll have to settle for a breezy, sunny day in Orlando instead. The binding really proved challenging on this project. 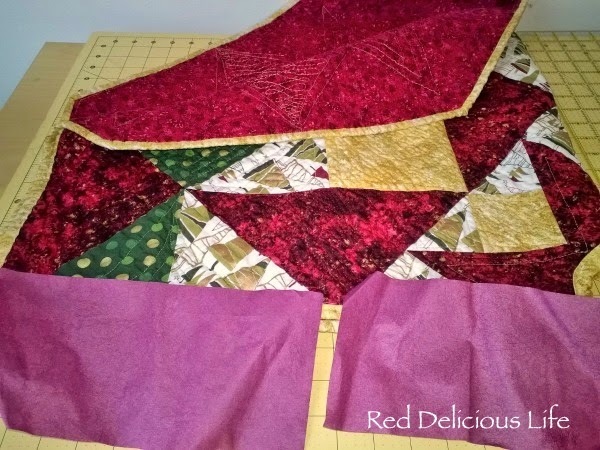 I was almost out of fabric and had just enough yardage for the straight binding but then what to do about the tree opening? 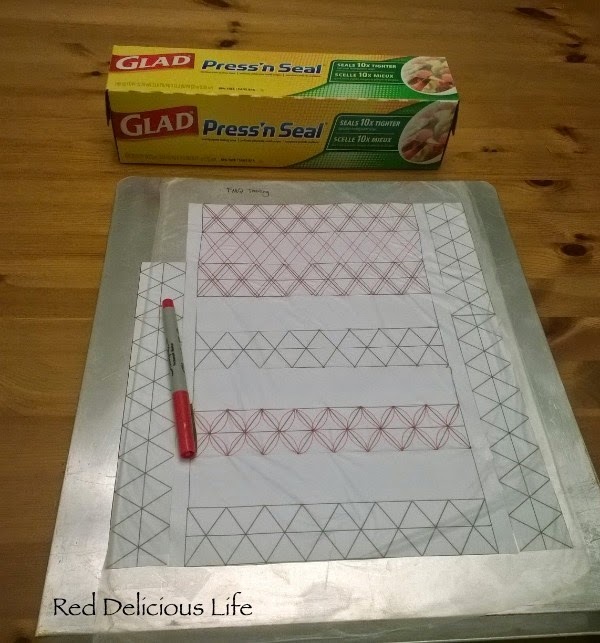 Luckily I made a mistake when cutting my blocks and had three 8½ inch blocks leftover so I used this video tutorial that I found online to make enough bias strips for the opening. (I didn't make a tube because the pieces were so small). Since I wasn't sure how long the bias binding needed to be, I couldn't join it to the straight binding until after it was attached. It was just one of those days where I joined the bindings incorrectly two times before getting it right. 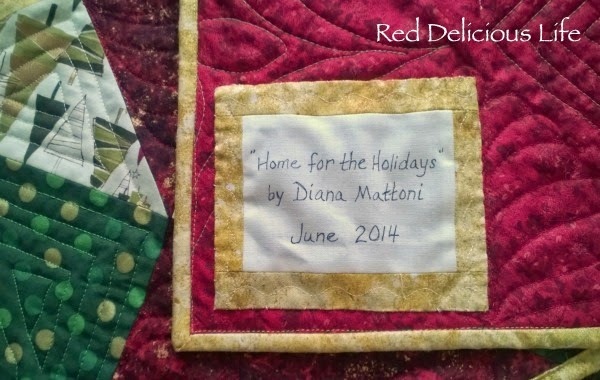 Of course I was so excited to finish this project that I just now noticed while writing this post that I put the wrong date on it! It's technically a July finish but I didn't realize it when I created the label. Oops!